I came across this line today through by Melissa Lawson. Melissa's line looks very Judy Jetson. I'm loving the space age inspiration. This is definitely a different take on plus size fashion. You can find this designer's pieces on her etsy shop. I, personally, would love to see how this designer develops in the future. What do you think of her line? Yea I have a very similar pair that are apart of my JIBRI jumpsuit...love them! I think that this a plus size designer stepping out on a limb and creating clothing based on inspiration rather than merely selling us the plus size counterpart to the clothing we see on smaller women. As a larger woman, I notice that much plus size fashion is very basic. How many t-shirts, jean, and cardigans can a girl wear? It's nice to see something out of the ordinary, even if I wouldn't wear it. The jury is still out of the dress and top, but I LOVE those pants! I think her shapes are different and inspiration. 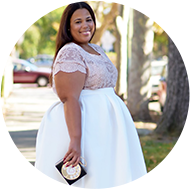 like the commenter before me stated, it is nice to see a plus size designer step out on a limb and design clothing that isn't just the basic clothes you find at your larger retailers. With that said, I personally don't think I'd wear either of these pieces, in thier current form, either a change of colors would make it more wearable for the top, and darken the dress a bit by adding black somewhere perhaps so that is doesn't look so easter meets judy jetson-ish. I'm feelin' it...I need those cropped tan trousers in my life ASAP!